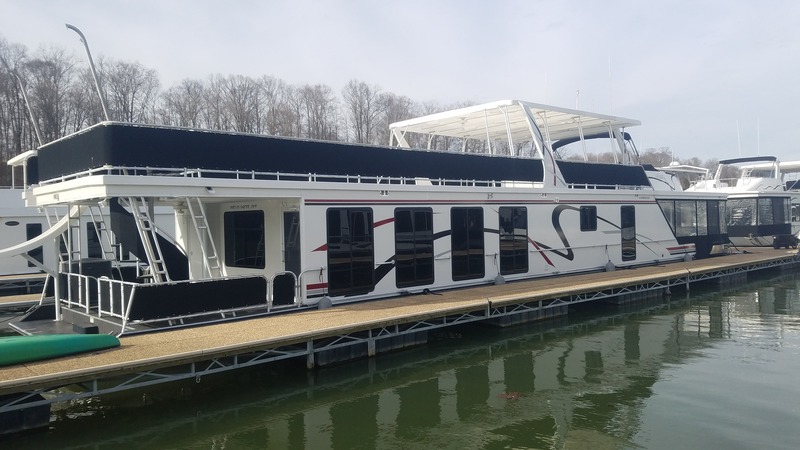 2009 SUMERSET 18 X 85 HOUSEBOAT SUPER CLEAN ORIGINAL OWNER THE LAST BOAT BUILT BY SUMERSET Four Bedroom: King Master, Two Queen, Two Single Two Full Bath w/ Tecma Heads TWIN Mercruiser 4.3L MPI 220 HP EFI V6 Engines w/ Bravo II Outdrives (160 Hrs) MMC Controllers (2) Halon Engine compartment automatic fire extinguisher New Engine, Generator and House batteries 2016 / 2017 20KW CO Safe Westerbeke EFI Generator w/ Safe-T-Stack 450Hrs (Includes spare parts kit) (3) Engine Compartment blowers Dual VHF Marine Radios with twin antennas Verizon High Gain Cellular antenna (Arch mounted) w/ indoor hot spot plug Dual Depth finders Garmin Full size GPS545 Chart Plotter with fresh water lakes Three 95 Gal Fuel Tanks with PWC Gas station Front & Rear 10” Hydraulic Thrusters w/ Joystick controls 4KW Outback Sinewave Inverter with 12 6-Volt Batteries 2 x 50 AMP Shore power connections with cords 50 Amp Ground isolators (Each Shore Power) Sumerset complete 220 Volt + 12 Volt Electric panels with Volt / Amp meters PWC Ramp with winch and remote control (Boat is built and wired for second ramp) Insulation Package with Thermopane insulated Windows Complete Front Deck Enclosure curtains 3 ½ Ton 13 Sear Carrier HVAC w/ Emerg Heat and Honeywell Wi-Fi Thermostat MSD Type II with Automatic 15 Gal. chlorinator: Uses 1 Gallon Clorox + 15 Gal water Tech Heads 600 Gallon Fresh Water Tanks (4 x 150Gal) (2) 19 Gallon Water Heaters Xtreme 450 Watt Emerg indoor Hull Heater 18’ Fiberglass Party Top with Bar, Sink, Refrigerator, cover and Six Tropitone Bar stools & Two FrontGate loungers Seating for 12 Topside front with Bimini top New Pithane Roof 2016 (2 Coats) New Char-Broil IR Grill Anodized rails throughout Full Fly bridge with cover, VHF Radio, All gauges, Depth Finder, MMC, Thrusters and Garmin Chartplotter All new LED rope lights on party top Slide with Lake Water pump and Swim deck ladder Lake Water wash down system Glass Top stove, Microwave, Dishwasher, Trash compactor GE Side By side refrigerator with pull-out Freezer, In Door Water + Ice Ceramic Tile Floors in Galley and bathrooms Dry Bar with Ice Maker Built in six person dining table w/ chairs + Kitchen counter w/ three chairs Whole Boat Alpine Audio w/JL Audio Speakers and Amp LED/LCD TV’s in all bedrooms w/ DVD Player in Master. Wired for both Cable and Satellite Helm and Arch pre-wired for satellite antenna Surround Sound systems with Yamaha Amp + DVD Player 42” Big Screen TV in Salon w/cabinets and leaded glass doors Smoke detectors and Halon extinguishers throughout Norwalk Couch Front Swing Frontgate Loungers w/ custom canvas covers ALL LED INTERIOR LIGHTS Dual front ceiling fans, Dual Top ceiling Fans, Rear Deck Master Bed and Salon ceiling fans Custom made bed spreads on all beds with Reverse-Tuck tops Serta King Mattress Master 2016 All cedar closets Rear Storage lockers with shelves, Fuel Gauge, Bilge pump and hydraulic outdrive controls All safety Equip:Engine room automatic Halon fire suppression system, (5) Halon Fire Extinguishers throughout, CO Detectors, Smoke Alarms, (8) Personal Life Vests All Dishes, Silverware, Utensils, cups, glasses, Coffee Maker, toaster, Vacuum Sweeper Spare Parts: Tie Up Ropes: 2-300’ ¾”, 3-300’ Nylon ½”, 150’ Double braid 5/8” Fortress 450 Aluminum Anchor w/ 300” ¾” Line NEW (2) Spare 50’ 50 AMP Shore power cords (1) Spare 25’ 50 AMP Cord NEW IN BOX (1) Genius 3 Bank house battery charger NEW IN BOX MSD II Aerator pump NEW IN BOX SURFLO Variable speed house water pump Thruster Joystick controller (Dual) (New) COMPLETE SERVICE RECORDS, Waxed twice per year, All Oil and filters changed annually. 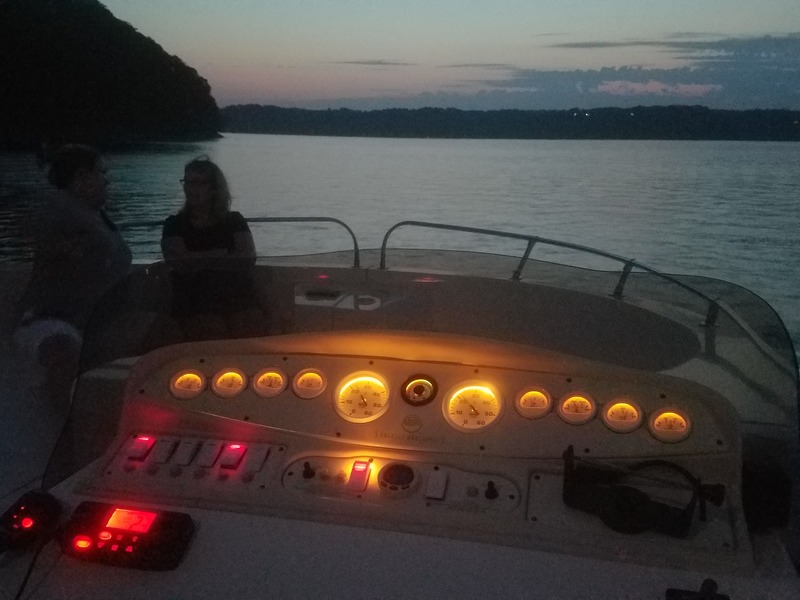 Boat is very well cared for!! Optional 2002 Sea Doo GTX 4 Tech 3 Seat Jet Ski available with BlackTip cover and Yacht Club trailer (Less than 300 Miles.